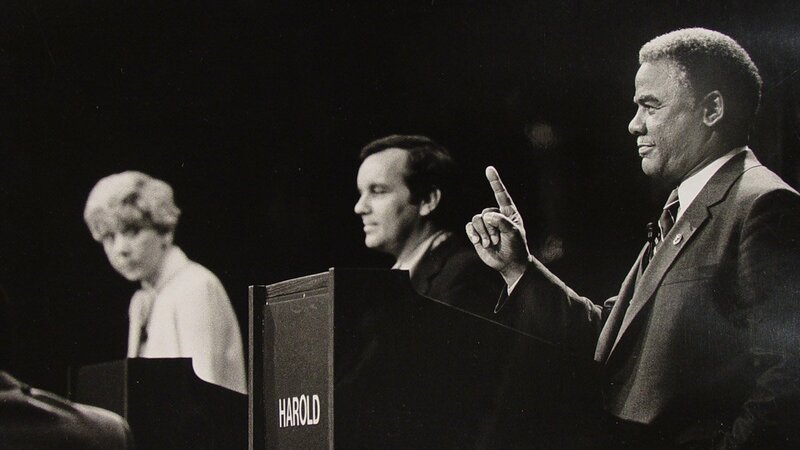 Harold Washington (1922 – 1987) was Chicago's first black mayor — winning the historic 1983 election by a narrow margin. Initially, Washington was a reluctant candidate. His failed 1977 bid for mayor six years earlier was still fresh in his memory, and he was comfortable in his position as a U.S. congressman. No longer was Washington willing to be part of the symbolic campaigns of the past. He agreed to run if the African American leaders recruiting him could meet two seemingly impossible conditions: find enough financial support, and register a significant number of new voters in the African American community. As it turned out, minority dissatisfaction with incumbent Mayor Jane Byrne was pervasive, and polls in black communities showed strong support for a black mayor. With more than 50,000 new black voters registered, Washington tossed his hat in the ring. Washington was an intellectual who connected with everyday people. His charisma, quick wit, playful spirit, and talent for wielding his huge vocabulary made him an attractive, and often entertaining, politician. In the Democratic primary, Washington narrowly defeated Jane Byrne and State's Attorney Richard M. Daley, (current Mayor of Chicago and son of the late Mayor Richard J. Daley) who split the white vote. Whites were flabbergasted by Washington's win and openly anguished over his nomination. Black Chicago erupted in joyful celebration. Racism in Chicago, which had been simmering throughout the primary, hit the boiling point. Life-long Democrats crossed party lines, machine leaders attacked Washington, and Byrne cut against Washington by mounting a short-lived write-in campaign. Bernard Epton, the Republican mayoral candidate, stirred racial fear and animosity with his campaign slogan, "Epton, before it's too late." But Washington's primary win was the spark that ignited a movement. Blacks, Latinos, and progressive whites feverishly built diverse coalitions, raised funds, registered voters, and packed rallies to standing room only. Washington's call for reform and fairness resonated with disenfranchised Chicagoans, all eager for change. On April 12, 1983, Washington won the general election. He took more than 99 percent of an enormous black vote and 82% of the Latino vote. But even though Washington had won the election, his battle was far from over. White political opposition to Washington's reform agenda was fierce. His first term in office was marred by racially charged fights and acrimony. The so called "council wars" brought the city to a near-standstill. Three years into Washington's term, a court order for special aldermanic elections in seven minority wards resulted in the election of pro-Washington aldermen which shifted the balance of power. Washington got busy and pushed ahead with his aggressive agenda on transparency in government, improving city services, and focused on community development and empowerment. Washington's even-handed approach to city government won over many of his critics, but frustrated some black nationalist supporters. If white mayors favored white citizens, they argued, why shouldn't Washington favor blacks? In spite of this, in his second election, Washington didn't lose many black or Latino voters. He started his second term at a gallop, setting aggressive liberal policies on affordable housing and immigration. But on November 25, 1987, seven months into his term, Washington collapsed at his desk and died from a massive heart attack. With Washington's death, the multiethnic coalition began to unravel, but his campaigns and elections had already changed the political power equation in Chicago. Blacks and Latinos discovered they had the ability to change how the city worked and Washington's reform agenda created a new, dynamic vision for what the city could be. In televised primary debates against Jane Byrne and Richard M. Daley, Washington demonstrated his trademark charm, quick wit, intelligence, and legendary vocabulary. During the primary and general election, Washington kept a hectic schedule meeting supporters and courting voters. 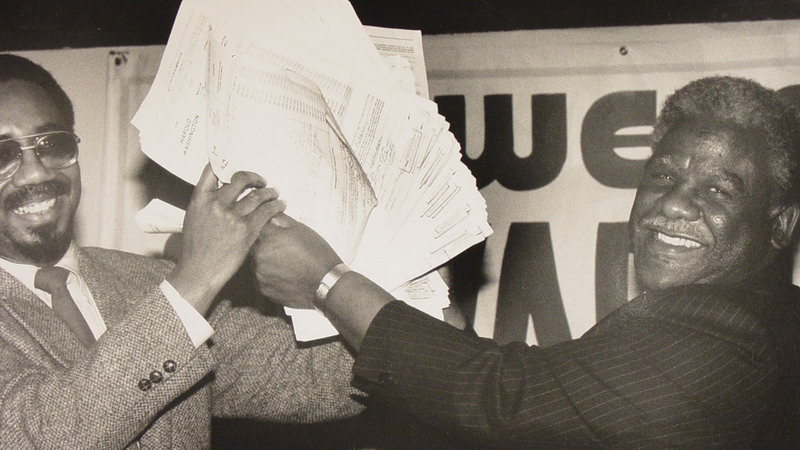 Mayoral candidate Harold Washington (right) and Bobby Rush, share a joyful moment during the 1983 Chicago campaign. 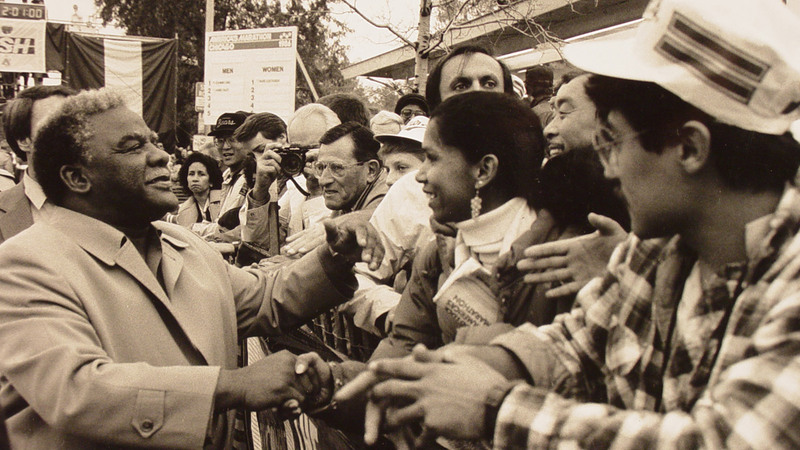 Cook County Commissioner Jerry "Iceman" Butler recalls what made Washington special to voters. Former U.S. Senator Carol Moseley-Braun fondly remembers Washington and tells stories about his time in office. Rev. Jesse Jackson describes how leaders in the black community convinced Harold Washington to run for mayor and how his campaign is irrefutably linked to the legacy of Dr. Martin Luther King's 1966 Chicago Freedom Movement.